In November 1904, Fr. 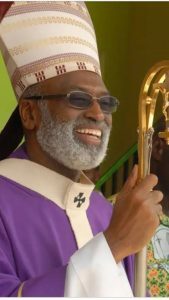 Isidore Klaus arrived from Nigeria to succeed to Bishop Albert as Apostolic Vicar and head of mission. Although his ministry was short, only one year, it was eventful. Sekondi was a harbour town; and the completion of the railway link between Sekondi and Kumasi made Sekondi an important trading centre, which attracted peoples from all over the Gold Coast. Settlers from Elmina had already started a community, which the priests from Cape Coast used to visit for baptisms, confessions and masses. For their meetings, St. Paul's hill was acquired, and two settlers from Elmina, Mr. J.E. Andoh and Mr. W.F. Laast, helped raise funds to build a chapel-school. When it was ready, Bishop Klaus went to bless it and to promise them resident priests. This was in 1905.